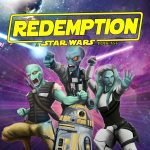 Having landed on the contested planet of Ryloth, the crew agree to go with REESE and ILAR to find a droid to experiment on. In the skies above, the droid army of the SEPARATISTS and the clone army of the REPUBLIC battle for the planet below. A battle that may engulf our heroes, if they aren’t careful enough….